C.E.T. 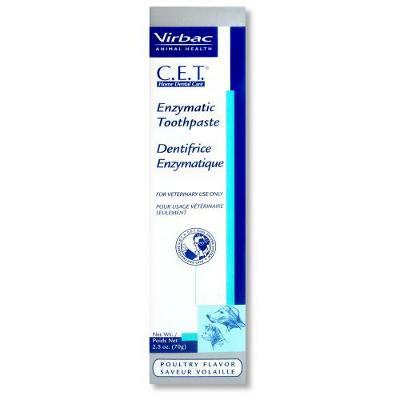 Enzymatic Dentifrice for dogs and cats is a poultry flavored toothpaste designed for daily use. The C.E.T. dual-enzyme system enhances and augments naturally-occurring oral defense mechanisms. Active Ingredients: Glocuse Oxidase, Lactoperoxidase. Also contains: Sorbitol USP/NF, Purified Water USP, Di-Calciuim Phosphate Anhydrous, Hydrated Silica, Glycerine, Poultry Digest, Dextrose, Xanthan Gum, Titanium Dioxide, Sodium Benzoate, Potassium Thiocyanate.